I just love my fellow Oregonians! 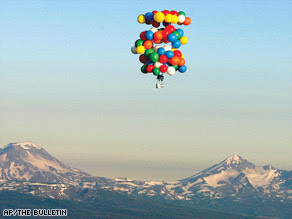 This man flew a lawnchair with helium balloons through Oregon for almost 200 miles! BEND, Oregon (AP) -- Last weekend, Kent Couch settled down in his lawn chair with some snacks -- and a parachute. Attached to his lawn chair were 105 large helium balloons.